BikeLakeland was founded to be an advocate for cyclists of all stripes, but our focus was always the cycling commuters and recreational cyclists. We’re proud of our work helping to establish bike parking in downtown Lakeland, our part helping Lakeland get named a League of American Bicylists Bicycle Friendly City, and as a co-sponsor of Lakeland’s BikeBash. But we’ve been quiet these past few months. It was intentional. We wanted to make a change. Gone were the days we could attend every city meeting that concerned cycling. We no longer wanted to organize social rides or events. We felt there were other voices that wanted to step up. So we decided to retool; to refocus. We’re going back to our roots: presenting information that speaks to our core focus: improving the experience for the bicycle commuter. BikeLakeland charges no dues and has no membership requirements. Simply follow us here and on Facebook. We promise to post informative and thought-provoking cycling articles that speak to our core values. We hope they help you, and the community, continue to enjoy a Bicycle Friendly City. But we should not be your only cycling advocate. There are many philosophies in the cycling world and it’s a rare group that encompasses all needs. We encourage you to investigate other cycling groups. 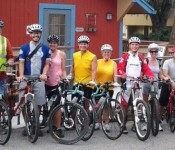 Each has a distinct view toward improving cycling and we applaud their efforts. It’s a great time to be a cyclist. In 2012, Florida Governor Rick Scott had our state opt-out of receiving the funds for RTP. There are reports that he may do so again. BikeLakeland is asking that you lend your voice requesting the Governor accept the funds for this important program. You may sign a pledge at People for Bikes or send a letter (suggested text).